April 5, 2012 - Top U.S. Transportation Department and Federal Aviation Administration officials met with aviation partners in Houston on Wednesday as part of a newly-launched collaborative effort to make air traffic control more efficient, help airlines improve on-time performance and reduce emissions generated by aircraft flying into and out of Houston’s airports. “Houston is testing technology and flight procedures that will improve on-time flights and increase safety and fuel efficiency,” said U.S. Deputy Transportation Secretary John Porcari. The FAA estimates that as a result of the Houston Metroplex airspace initiative, airplanes will fly 648,000 fewer nautical miles annually, based on flight plans. This and other NextGen procedures will save up to three million gallons of fuel and reduce carbon emissions by as much as 31,000 metric tons each year. A Metroplex is a major metropolitan area with multiple airports, where heavy traffic and environmental constraints combine to hinder efficient movement. Metroplex initiatives are under way or planned in 21 metropolitan areas across the country including Atlanta, Charlotte, Dallas-Ft. Worth, Washington D.C. and Northern California. “Through NextGen, the FAA and members of the aviation industry are teaming up to make some of the most complex airspace in the country some of the most efficient,” said Acting FAA Administrator Michael Huerta. - Creating Optimized Profile Descent (OPD) procedures into George Bush Intercontinental and William P. Hobby airports. OPDs allow pilots to almost idle the engines while the aircraft descends at a constant rate, like sliding down a banister. Current airspace procedures require planes to level off at certain points to allow for coordination between air traffic controllers. OPDs reduce fuel consumption and carbon emissions. - Creating more efficient routes between Houston and the Dallas/Fort Worth Metroplex areas to shave miles off of each flight through this busy corridor. - Developing similarly efficient alternative routes that can be used when bad weather affects normal arrival and departure paths. - Establishing departure and arrival routes that align airplanes on preferred paths, which will also reduce the number of miles flown. - Utilizing side-by-side arrival routes into George Bush Intercontinental Houston Airport to increase airspace efficiency and provide more direct routing. - Developing satellite-based departure procedures that would provide predictable, repeatable paths that are designed to allow planes to climb without leveling off, which brings them to a cruising altitude sooner. The Houston Metroplex was also selected by the Obama Administration as one of 14 high-priority infrastructure projects that are ideal for expedited completion. Rather than taking three years to complete, this project will be completed in two years through environmental streamlining and concurrent reviews. 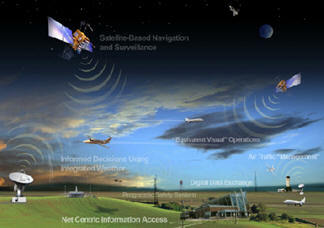 The airspace improvements are part of the FAA’s overall NextGen program, which is transforming the radar-based air traffic control system of today to a satellite-based system of the future. A key component of NextGen has been in use over the Gulf of Mexico since January 2010. Aircraft equipped with a technology called Automatic Dependent Surveillance-Broadcast (ADS-B) are able to constantly broadcast their location, altitude and speed, allowing the FAA to provide radar-like services to areas that previously had no radar coverage, such as the Gulf. The collaborative regional partnership includes the FAA, the National Air Traffic Controllers Association (NATCA), United Airlines, Southwest Airlines and the Houston Airport System. "The Metroplex effort is critical to the safety and efficiency of our aviation system, and Houston – one of the nation's busiest airspaces – is a great place to showcase this initiative” said NATCA representative Keith Brown. “Metroplex will make air travel a better experience for everyone. NATCA is proud to be partnering with the FAA to create the best and most technologically advanced aviation system in the world." “Southwest Airlines is committed to the design and implementation of safe and efficient flight procedures that benefit the traveling public and the communities surrounding the Houston Metroplex,” said Captain Chuck Magill, Southwest Airlines Vice President of Flight Operations.